Hello everyone. You may or may not have noticed that we have been adding a new featured rig on the Front Page of MI now. The Featured Rigs will be rigs from around the Interweb that we find to be really cool and inspiration mods. Some will be technical, some will be stylish, and some will just be insane. But they will all have that one thing that sets them apart and we just want to share that with you no matter the source. So feel free to talk about the current featured rig here, or suggest a rig that you feel should be featured here. That's what modding is all about. Finding and sharing the latest cool mods. I hope you enjoy them. 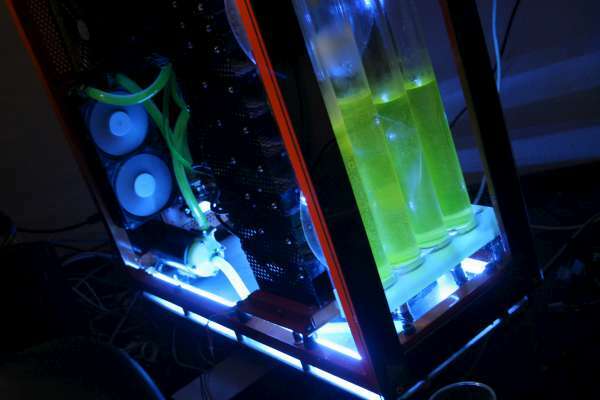 Today's feature rig is by a modder that goes by grevaeg over at bit-tech. His worklog is really amazing as well as his monster rig. Be sure to check out his worklog as it is quite impressive. I really love watching scratch builds progress personally. I actually find watching them build more interesting then the end product at times. Here is the Link to it on our featured rig section which will also take you to the bit worklog as well. I hope you enjoy it.